More Horsepower and Torque - You'll have 1-3/4 HP at your command if you're using a 120 Volt circuit and a full 2 HP if you're using a 240 Volt circuit. PLUS - you'll enjoy at least TWICE the torque of your current Mark V throughout the full speed range. As a result, you'll be able to increase your depths-of-cut and feed rates to achieve the kinds of operating efficiencies with your Mark V and Shopsmith Special Purpose Tools that were once reserved for high-powered commercial machinery. Broader Speed Range - From 250 to 10,000 RPM. On the slow end, you can bore huge holes for clocks or similar projects without burning your bits. PLUS, drill metals - turn large diameter spindles or bowls - resaw thick stock - and lots more. On the fast end, you'll rout or shape without feathering, chattering or splintering - and joint or plane smooth edges or surfaces at lightning speeds. Dual Direction Operation - You'll enjoy electronically controlled forward or reverse operation for performing bi-directional sanding, with-the-grain cuts and safe, under-the-workpiece shaping operations. You can even back a bit out of a deep hole or cut to clear chips or shavings, if necessary. Digital Controls - Its intuitive design offers membrane-style push-pads for controlling motor speeds, direction and more. Use the five presets to select an approximate speed, then move “UP” or “DOWN” from there in as little as 1 RPM increments. It also includes a built-in Speed Chart that will select the ideal speed FOR you, based on the bit or blade you're using, the operation you're performing and the material you're working with. There's even a lock-out function to prevent children or other unauthorized users from operating your machine. Saves Energy - Since the PowerPro uses Intelligent Adaptive Power Delivery to draw only the power it needs to maintain its selected speed under load, it has been proven to save up to 80% of the energy and emissions over conventional motors. As a result, you'll get more than enough additional usable power from a standard 15-20 AMP home circuit to operate multiple power tools (i.e. Mark V and Dust Collector) simultaneously without blowing a fuse. Operates Smoothly & Quietly - The unique compensating technology of the DVR motor ensures operational and speed-changing smoothness. And, when you couple this with the heavier motor with HUGE bearings on BOTH ends of the shaft and precision CNC-machined, wobble-free pulleys, you'll discover that the PowerPro is extremely quiet at idle and all speeds. 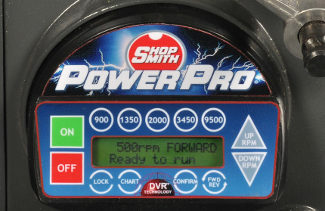 Low Maintenance - Since the PowerPro uses electronic speed control, there are no mechanical speed-changing components to adjust, repair or replace. PLUS - every component operates with sealed bearings that require zero lubrication. The totally enclosed fan-cooled motor virtually eliminates dust problems and the rugged Poly-V Belts last almost indefinitely. If something goes wrong, the Control Panel describes the problem and you can easily unplug, remove and return any component to the factory inexpensively for repair.